We are loving our new stone patio, including the string lights, comfy furniture, and being outside. What I don’t love? Bugs! Those darn mosquitoes cause all kinds of problems, and I knew we needed something to keep them away so we could enjoy ourselves. I wasn’t sure about the citronella candles in the store, what was really in them, or how well they would work. 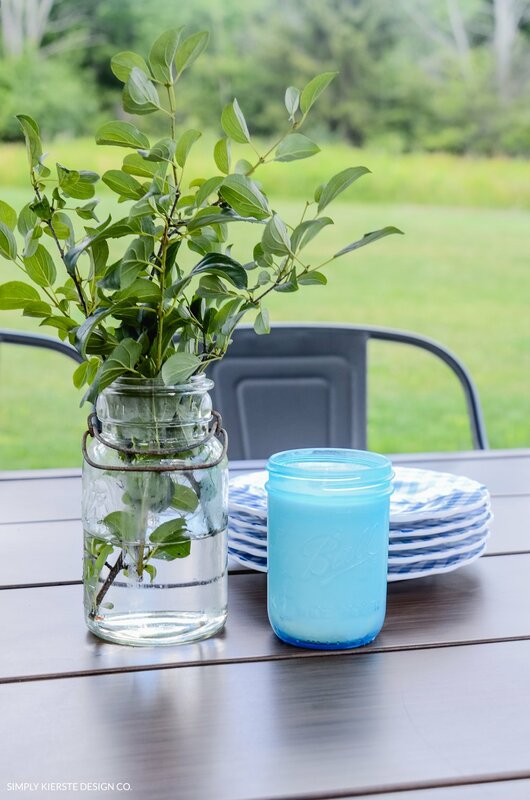 I decided instead to make my own Mason Jar Citronella Candles, with citronella essential oil–known to keep mosquitoes at bay. 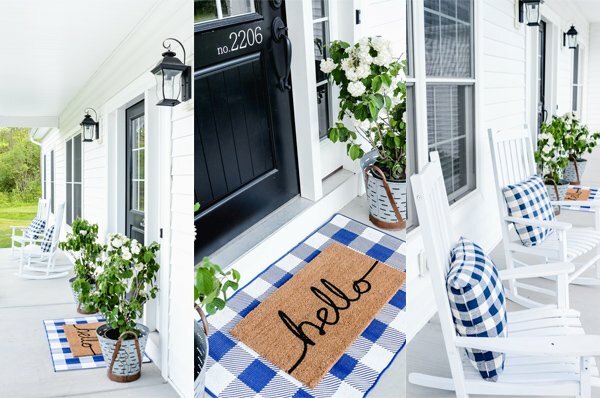 It turned out to be a fun and easy project, and I really love the farmhouse style vintage blue mason jars I used. They’re cute, functional, and give a great ambiance when they’re burning! 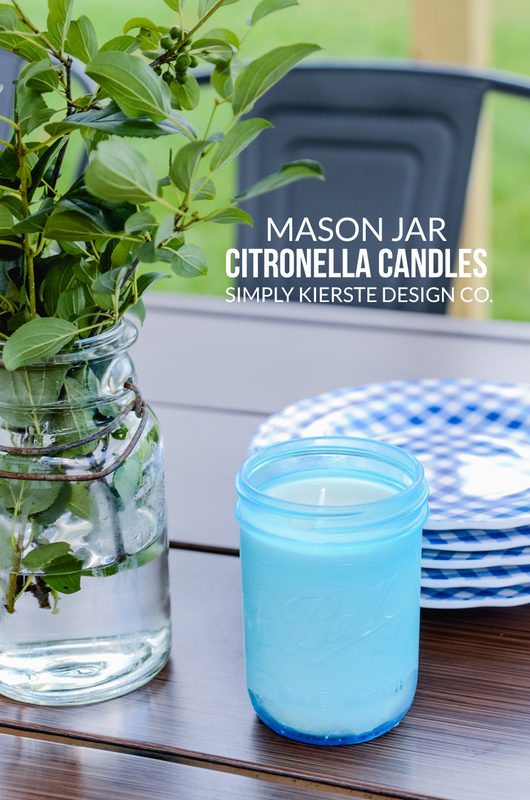 I looked around and found several different ways to make mason jar citronella candles, but I wasn’t thrilled about using citronella oil (too much of a potential fire hazard for me), and some of the others were cute but didn’t last longer than a couple of days (perfect for a party, but not what I was looking for). 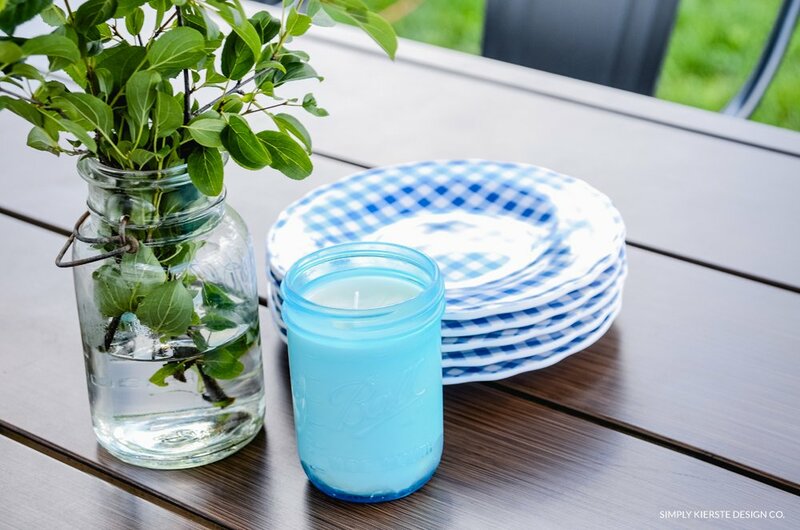 Instead I decided to try my hand at candle making, and use wax, citronella essential oil, and my favorite blue vintage mason jars to create what I wanted. I’m so glad I did–I LOVE them! There was definitely some trial and error involved here, but after a few tries I got it down, and I’m going to share all my tips and tricks with you! It really is an easy and fairly quick process, and I had them made in less than 30-45 minutes. A few hours for them to harden, and they were ready to use. 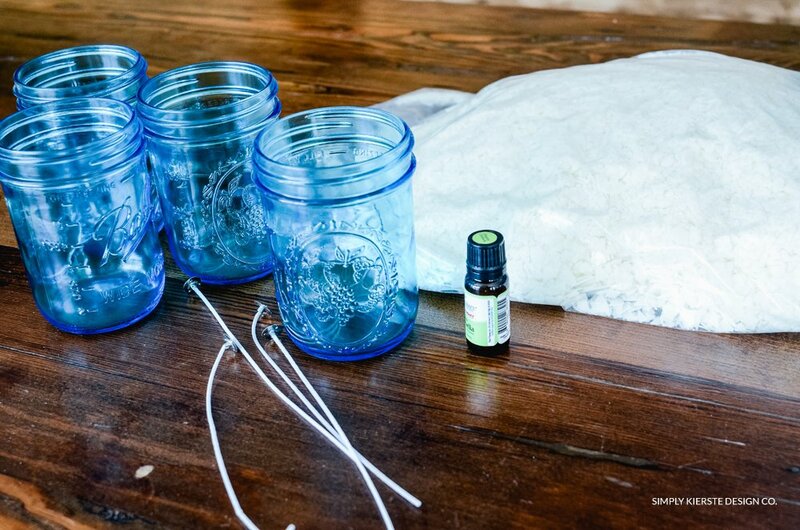 The supplies I used are linked below, including the citronella essential oil! DIRECTIONS: Lay out your work surface and all of the ingredients. I would suggest some kind of covering for your table or countertop–like a large plastic cutting board or piece of wax paper. It helps to protect it when pouring hot wax, just in case you spill some. 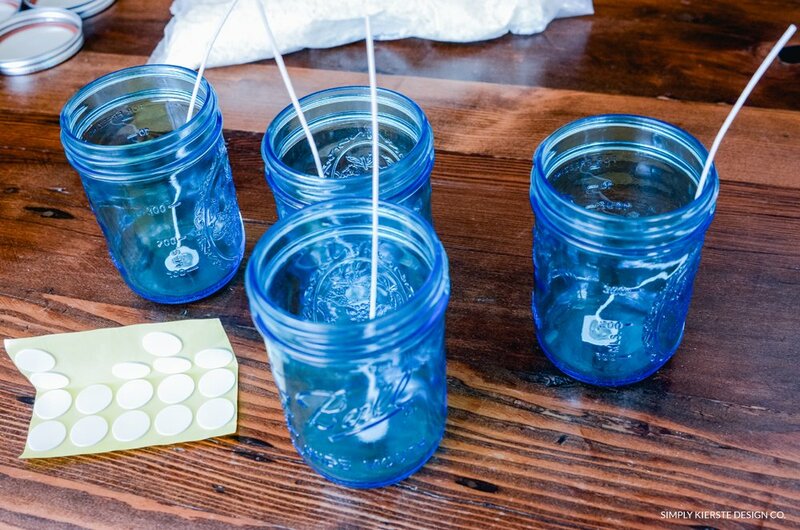 Prepare your jars by removing the lids, and placing a wick in the bottom of each one. I bought 8 inch wicks, so they would be tall enough to go above the rim of my pint jars. They also came with stickers that adhered them to the bottom of my jars. If your wicks don’t come with them, you can always use hot glue or even a piece of painters tape instead. I read that it was a good idea to warm your jars in the oven on the lowest temperature, so the wax will cool evenly. I did try that, but it ended up causing the the wicks to actually come out of the metal piece attached to the bottom, ruining them. I used regular candle wicks, so I’m not sure why it happened, but I ended up not warming my jars, and it worked out just fine. 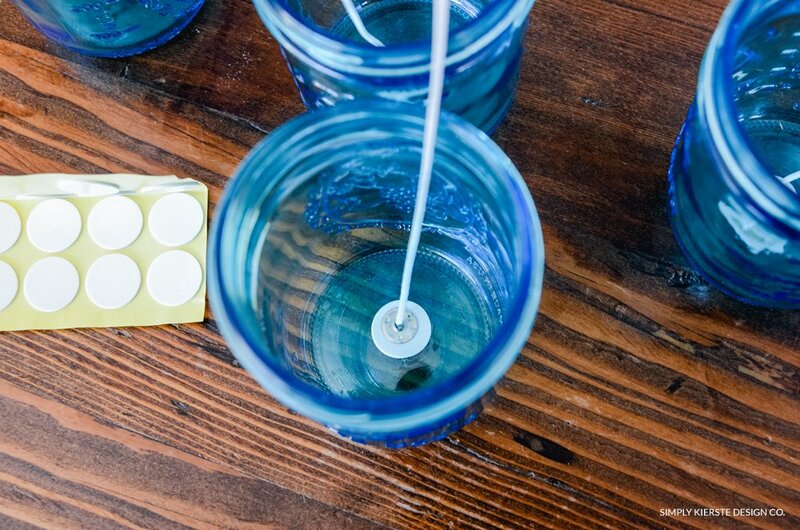 It might be worth it to try out one jar and see what happens! Measure out the desired amount of wax flakes. (I filled an 8 c. glass measuring cup, and repeated this process a couple of times.) Keep in mind that once the wax is melted, the volume reduces to about half. Melt the wax in a double boiler (I used a oven safe bowl over a pot of boiling water) until all the pieces are liquid. It looks kind of like olive oil! Let it cool for a few minutes. Add the citronella essential oil. I used about 75-80 drops per pound of wax. Stir well, and let it cool for a few more minutes. 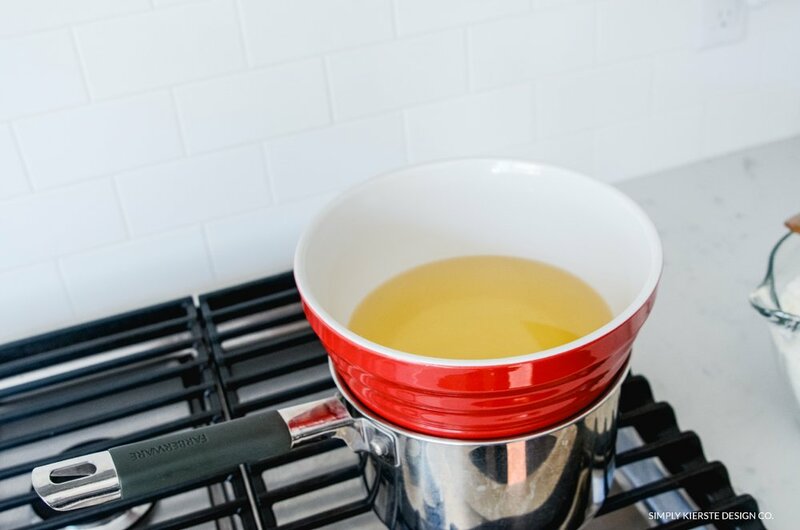 Warm the glass measuring cup (with a spout) in the microwave for 3-5 minutes while the wax is cooling (or even start it when you add the oil). 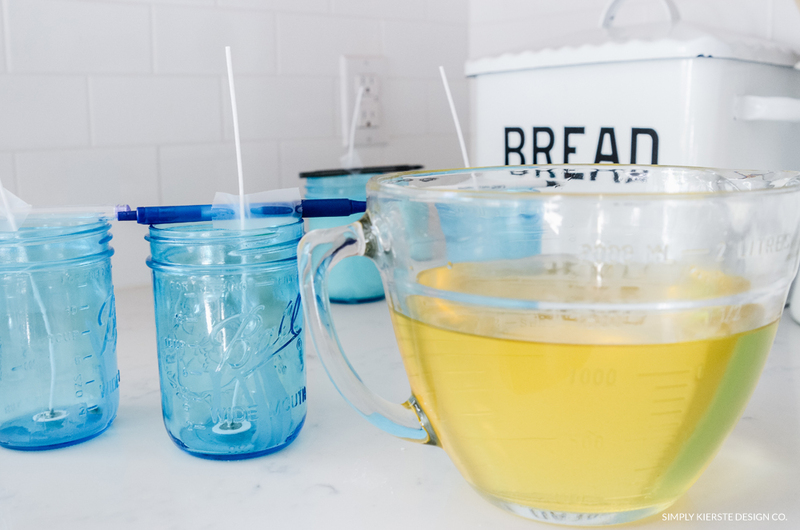 A spout means way less mess, and warming it means the hot wax won’t immediately solidify once you transfer it to the measuring cup. Believe me…I learned this the hard way, and it’s a super important step!! It makes it SO much easier! 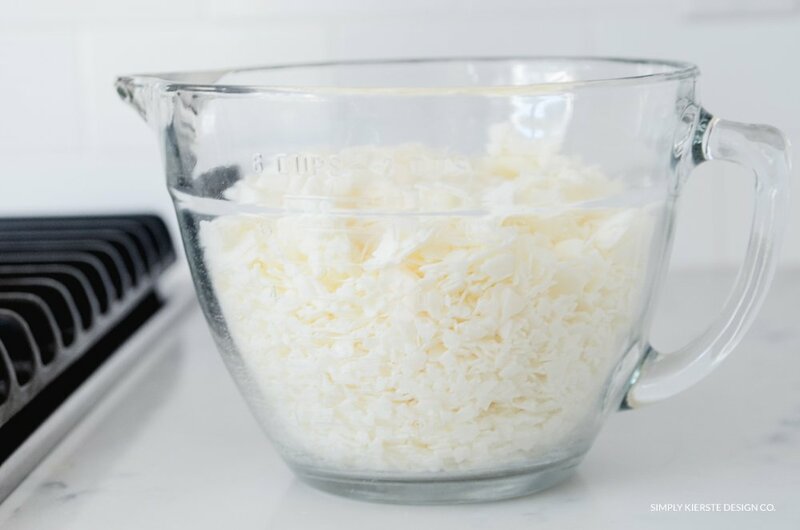 Transfer the melted wax from the bowl/double boiler to the warm measuring cup, then use the measuring cup to pour the wax into the jars. Either wrap each wick around a pencil, or tape it to the side, so the wick will stay straight while the wax is hardening. Let the candles sit until the wax has hardened, then trim the wicks to about 1/2 above the candle. 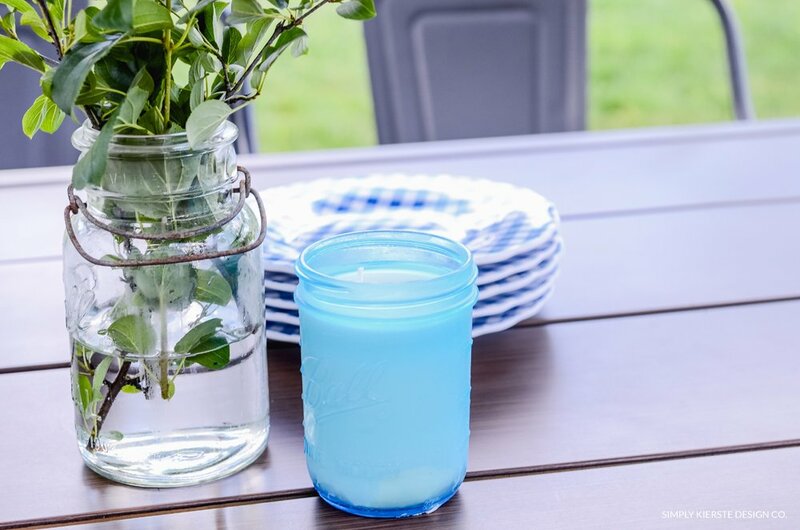 Now you have the cutest Mason Jar Citronella Candles!! 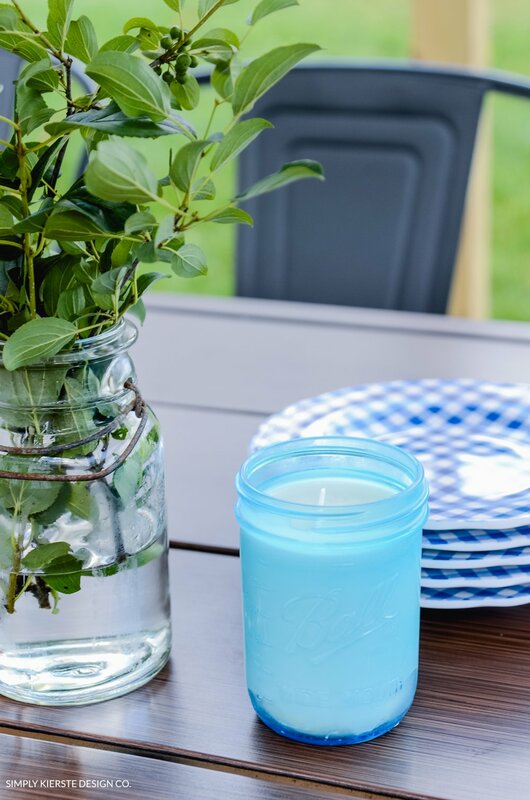 I love love using them on summer nights especially, and they look adorable out on our patio table, or even out by the fire pit on our picnic table. We are ready for a bug-free summer!! 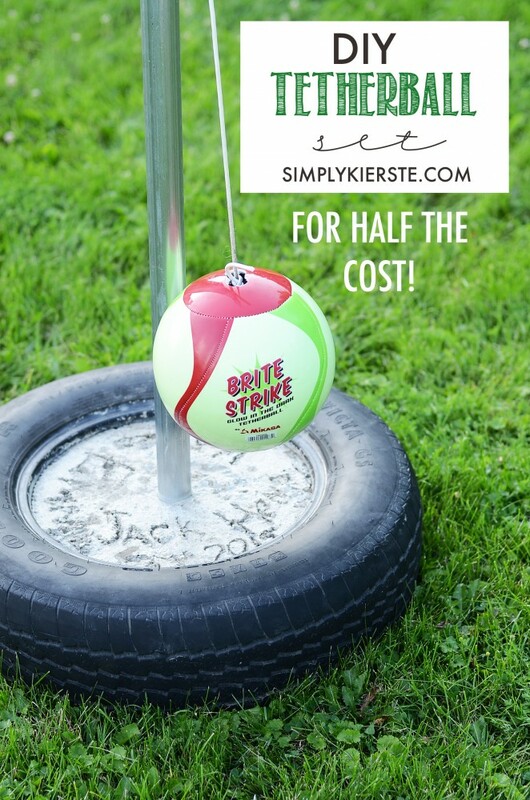 DIY Tetherball…for half the cost! Nice, where did you get the citronella oil? Glad you found some! I do have the link in my supplies list to the place where I got mine too. Where did you get your citronella essential oil? You never cease to amaze me. 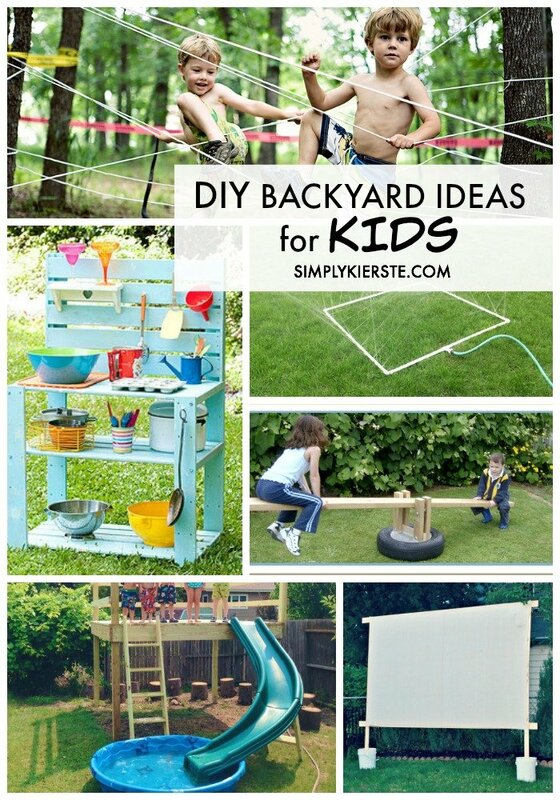 Your ideas, talent,patience and your forever “cute”decor diy projects !!!!! Your family is blessed beyond measure to have you as their Mama/ wife…….